You can download iOS 11, 11.2, 11.1.2, 11.0.3 final IPSW links to install on iPhone X, 8, 8 Plus, 7, 7 Plus, 6s, 6, SE, 5s, iPad mini 2 and over, and iPod touch 6th-generation. 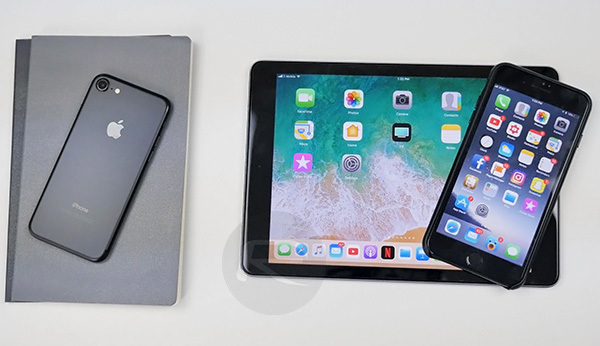 Announced first at WWDC 2017, iOS 11 is Apple’s latest major update for iPhone, iPad and iPod touch devices, brining in a number of new features to one of the world’s most popular mobile platform. For a full list of features on what’s new in iOS 11, you can check out our separate detailed post on it here: iOS 11 Features, Release Date And More Announced, Here’s Everything You Need To Know. The following guide will help you download and install iOS 11/11.2/11.1.2/11.0.3 on your compatible iPhone, iPad or iPod touch device the right way. To find out whether your device is compatible with iOS 11 or not, you can check out the details in our iOS 11 compatibility post here. It’s also highly recommended that you make a complete full backup of your device, either using iTunes or to iCloud, before installing iOS 11 on it. You can follow our full guide on how to prepare your device for iOS 11 here which includes instructions on how to backup: How To Prepare For iOS 11 Update Release On Your iPhone And iPad. Ready? Here’s how to go about installing iOS 11/11.2/11.1.2/11.0.3 on your iPhone, iPad or iPod touch device. The easiest and fastest way to install any iOS update is via OTA update method, but it may not be the best option compared to clean install method (more on that below). 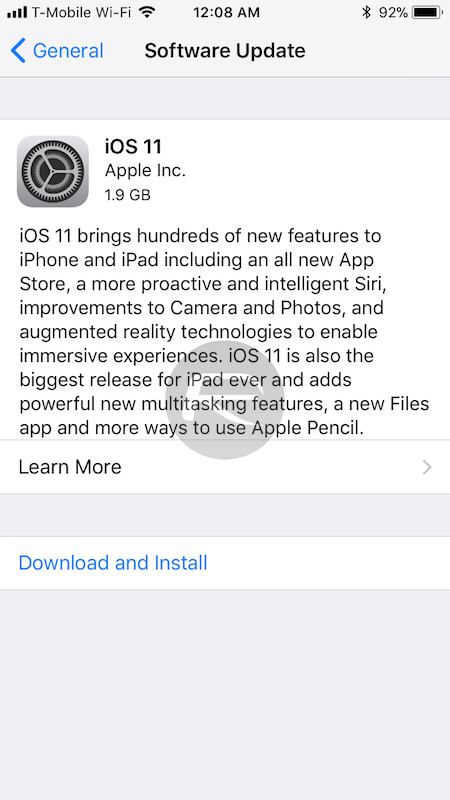 In short, if you don’t want to go through the hassle of doing clean install and could live with some performance compromises, iOS 11 OTA update install is the way for you to go with. Step 1: Navigate to Settings > General > Software Update section on your compatible 64-bit iPhone or iPad device running iOS 10. Step 2: Now simply wait for for iOS 11.x OTA update prompt to show up. Step 3: Once you see it, as shown in the screenshot above, tap on Download and Install button to begin installing it. For the best performance and battery life, we recommend doing a clean install of a major release of iOS like iOS 11. This is because when moving from iOS 10.x to a major version release like iOS 11 via OTA method, the software does tend to leave some older system files from previous version of the OS due to big changes underneath, which in turn could affect performance or battery life of the device. So if performance and battery life are the biggest concerns for you, follow our detailed guide here to do a clean install of iOS 11 on your compatible iPhone, iPad or iPod touch device: How To Clean Install iOS 11 Via iTunes The Right Way. For connivence, we have linked direct download links of latest iOS 11.2 from Apple below. Update x1: iOS 11.0.1 is out now. The post above has been updated to reflect this change. Update x2: Apple has now released iOS 11.1 beta 1 for developers and public beta testers. You can learn about how to get access to it here: Download iOS 11.1 Beta 1 IPSW Links And OTA For iPhone, iPad, iPod touch. Update x3: With Apple having now released iOS 11.0.2, we have updated this to reflect the changes. Update x4: iOS 11.1 beta 2 is now available to download. Update x5: iOS 11.0.3 is now available to download. We have updated the post to reflect all new changes where applicable. Update x6: Apple has released iOS 11.1 final version for all devices. Update x7: Bug fix iOS 11.1.1 has been released for all devices. Update x8: iOS 11.1.2 is now out for compatible devices. Update x9: Apple has released iOS 11.2 final version for all compatible iPhones and iPads. Not out yet. 2hrs and 45mins still. On my iOS11 GM iPhone 6S, some features are not working: drag and drop, select multiple icons at once, wi-fi network share and some others. When the full iOS comes out, will I be able to update from GM? Do not download on 5S!!!! Killed my iphone! I can’t find iOS 11.1 neither on iPhone 7 , nor iPhone 8 ! was it released yet ? Is it a fake news? What the F! I clean install my ipad just to find out that it wasn’t 11.1 but still 11.0.3? What the heck? This isn’t responsible blogging. Didn’t know fake news is covered by your site?! Btw why are you blocking my comments! That’s funny. This article says “iOS 11.1 IPSW Download Links” but the url is for 11.0.3!? !